SAN DIEGO, Calif. – July 23, 2015 – The 19th annual Suja Rock ‘n’ Roll San Diego Marathon & 1/2 Marathon is opening its corrals for the 2016 race with special early bird pricing, available today only. Participants can register for the marathon ($69), half-marathon ($59) and two-person half-marathon relay ($85) online at runrocknroll.com/san-diego. Early bird pricing ends on Friday. Last year’s race was a true testament to the fact that anyone can run as 92-year-old Harriette Thompson set the record as the oldest woman in the world to run a marathon. The two-time cancer survivor started running at the young age of 76, and ran her 16th Suja Rock ‘n’ Roll San Diego Marathon in May 2015 to raise awareness and funds for the Leukemia & Lymphoma Society. All races start in Balboa Park and finish at Petco Park in downtown San Diego. The marathon course travels through iconic Little Italy, Old Town and Bay Park—running almost completely separate from the 13.1-mile course. The half marathon ventures all the way up to Normal Heights, with the majority of the course wrapping around Balboa Park. Both courses showcase some of San Diego’s most scenic hotspots and eclectic neighborhoods. For more information or to register for the event, visit RunRocknRoll.com and follow the marathon on Twitter @RunRocknRoll. The 19th annual Suja Rock ‘n’ Roll San Diego Marathon & ½ Marathon will run through San Diego over the weekend of June 3-5, 2016. The race is known for lining the course live bands and cheerleaders interspersed with themed water stations along the route. The original Rock ‘n’ Roll Marathon in 1998 is still recognized as the largest inaugural marathon in U.S. history with 19,979 entrants. A free two-day Health & Fitness Expo at the San Diego Convention Center kicks off race weekend, featuring the latest fitness retailers, exhibits, free samples and interactive clinics. The event concludes Sunday afternoon with the Toyota Rock ‘n’ Roll Concert Series headliner performance inside Petco Park. Over the 18-year history of the Rock ‘n’ Roll Marathon Series, charity partners have raised more than $310 million through the events for a variety of worthy causes. 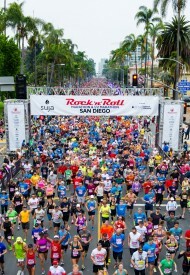 For more information about the Suja Rock ‘n’ Roll San Diego Marathon, please visit RunRocknRoll.com.